- Added 12 new puzzle packs to the Shop. I like the pictures they provide and that I can use my own as well, and there is a nice selection of piece sizes. I still find two problems, the worst is grabbing the pieces, more often than not I will put the cursor on a piece to drag only to find that I am moving a different piece. Sometimes its that their is a piece hidden under the one I was trying to grab, but sometimes I will click on a piece and another one that is right next to it (not even touching) will move. I don’t use the timer, but if I did this would be more than just annoying. The second problem is scattering the pieces, if I have the preview open then the scatter pieces shouldn’t move behind the preview, again if using the timer this would be. big annoyance. But worse than that is when the pieces scatter on top of each other, even when there is room for that not to happen. Why is this a problem? Because of the first problem, grabbing a piece that you see usually results in moving the piece underneath, not the piece you think you’re grabbin. 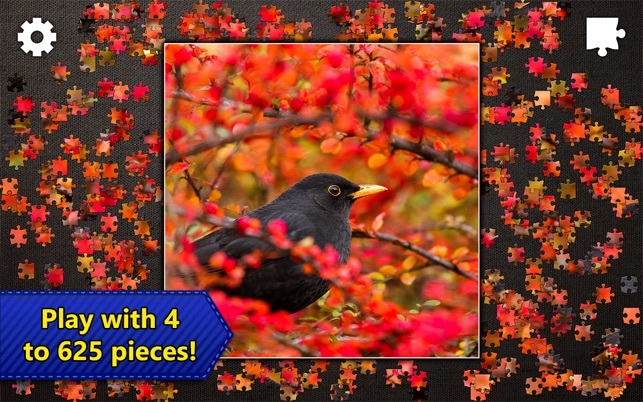 Update: Still love this jigsaw puzzle app. three years later. I like that the coloring of the pictures has not been altered. The puzzle pictures are fun to work on. Picking the number of pieces I want in the puzzle, as well as being able to rotate them - or not and using my own pictures is great! I was having an issue getting all my in-app purchases to download to my iPads. After trying all the suggested fixes listed in the FAQ I contacted support. The response I received was quick, friendly and very helpful. Now all my purchases are available on my iPads. 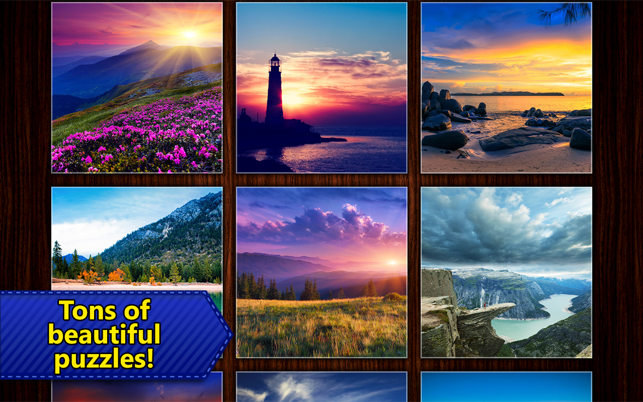 If you haven’t tried this jigsaw puzzle app, give it a try. You will be very happy. 2015 review: Great pictures. Puzzle pieces look pretty realistic. Definitely like the ability to create jigsaw puzzles from my own pictures, as well as having the option to change the backgrounds (both available with the paid version). It does get tiring using the track pad while clicking and holding to drag the selected piece to its destination. I switched to using a mouse; however, the mouse action is a little sloppy when trying to pick a particular piece to move when there are many other pieces around it. The best feature of this game, it is my favorite way to relax after a taxing day. I am currently playing this game on a 15” MacBookPro but I do look forward to playing this game on my iPad. 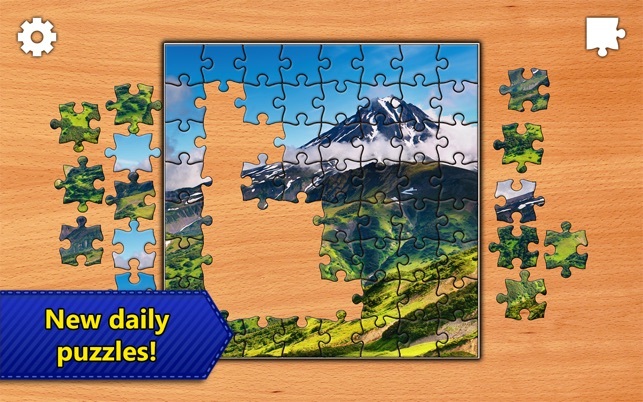 I have completed most Jigsaw levels on my first generation iPad 5 which cannot be updated. My browser on my old Windows Vista desktop kept sending me messages that it would not be able to continue to provide support after a certain date. So, I decided to breakdown and purchase a new MacBook Pro. At first, I thought I wouldn’t be able to get a Jigsaw app for the MacBook Pro. My first search only brought up Jigsaw puzzles for the iPad or iPhone. 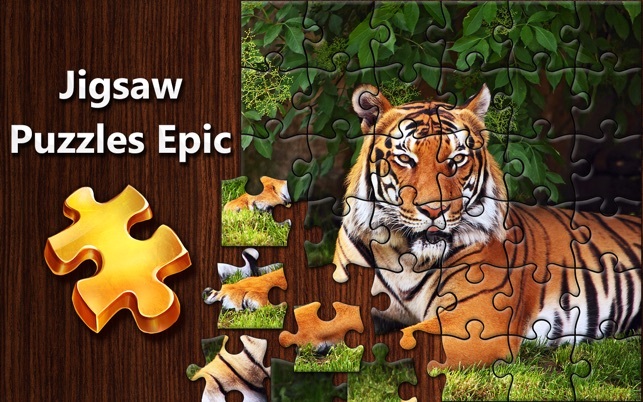 However, a persistent search brought up a menu for Macbook apps, and I purchased Jigsaw Puzzles Epic for my Mac. I could not be more satisfied. I have a 15” MacBook Pro and the resolution of the puzzles is beyond awesome, and the menu directions are unbelievably easy to access and use. I still have that old Windows Vista running but I think I will be retiring it soon.